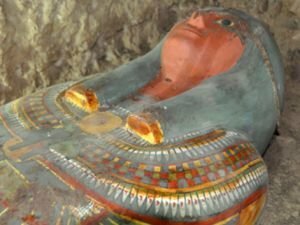 The sarcophagus with its millennia-old mummy was discovered in the southern Egyptian city of Luxor by a team of Spanish archaeologists, writes the British Independent. Newest materials along with materials on Tombs. Find out about mysteries, stories and convenient advice on Tombs. Read the newest articles and publications about Tombs. In 2013, scientists discovered a tomb near the Egyptian city of Saqqara that was literally transformed into a monument dedicated to the love between Meritisis, a priestess of the god Ra, and Kai, the pharaoh's court singer. The largest and deadliest Viking ax has been discovered in Denmark. It was found in an excavated tomb of a powerful couple from the 10th century. The remains of a ship were unearthed at the necropolis of the Abusir pyramids near Cairo. It most likely belonged to the keeper of the necropolis. Recently, Chinese archaeologists discovered more than 2 million copper coins in an ancient tomb in the region of the city of Nanchang, China. The coins are more than 2000 years old. The decorations on the mummy reveal its high status. The largest of these is the necklace, with alternating semiprecious stones and gold plates. Attached to it is a finely crafted golden shell, weighing 0. 71 oz (20 g). National Geographic magazine announced that the tomb of the most ancient brewer has been discovered in Luxor, Upper Egypt. It is believed that he lived around 3200 years ago. Grave of men kissing was discovered in 1964 during an archaeological excavation of ancient tombs in the vicinity of Cairo. Giant Pyramids are hidden beneath the hills in the region of Lugansk. The findings encountered by archeology interns. Lugano pyramids are not Tombs and Sanctuaries. Discovered the tomb of Cleopatra and Mark Antony? Spaceships to Take Human DNA to Other Planets?